Scarlett Curtis, curator of Feminists Don't Wear Pink (and other lies), is determined to dismantle the patriarchy. She discusses how we can all fight the feminist fight. I didn’t know I was a feminist until I was fifteen. I didn’t know I was a feminist because I didn’t know I needed to be, and I also didn’t think I would still be allowed to wear make-up if I became one. And I seriously loved make-up. I went to school just like my brothers, my mum had a job just like my dad. Feminism was something that we learned about in history class and didn’t have to worry about any more. Like telegrams or corsets or the plague, feminism was the stuff of suffragettes and burnt bras and fights that had been won and long forgotten. Much like a rare breed of bird, I knew feminists still existed out there in the wild. I also knew I most definitely did not want to be one. For starters, it was the middle of the noughties, and in a world where Beyoncé existed I couldn’t fathom what on earth these feminists were fighting for. More importantly my image of a ‘feminist’ was entirely in opposition to every single priority my fifteen-year-old brain possessed. Feminists didn’t use make-up (my favourite hobby). They didn’t shave their legs (my favourite form of exercise). Feminists didn’t like boys (my favourite type of human) and, most importantly, feminists definitely didn’t wear pink. And pink was my favourite colour. Being a feminist would mean disposing of half my wardrobe, revealing my spotty skin and hairy legs to the world and putting an end to the twenty-plus daily MSN messages I sent to boys I had crushes on. There’s an amazing feminist superhero called Audre Lorde who said: ‘Our feelings are our most genuine paths to knowledge.’ My nosedive into feminism was fuelled entirely by feelings. In the years since, it has developed and grown into something far wordier, filled with thoughts, books, quotes and plans for action; but at the beginning my feminism was just a feeling. My feminism was born with little context or language and lots of emotion. When I was fifteen I was treated very badly by a group of men and a few women who wouldn’t have treated me that way if I had been a man. I was a teenage girl with blue dip-dyed hair and a predilection for wearing tutus to hospital appointments. I was very ill and I was misdiagnosed and mistreated for far longer than even an irritating teenager who could probably have done with being knocked down a few pegs deserves to be. I was mistreated and silenced for a number of reasons that only now, nearly a decade on, am I finally beginning to unpick. It happened because I was young, because I was emotionally ‘complicated’, but it also happened because I was a girl. And because the person sitting next to me in every waiting room, doctor’s office and hospital ward was a woman and a mother. In the grand scheme of heinous acts committed by the patriarchy, what happened to me was very small. It was very small and it got better, and I’m extremely lucky. But it did happen. And it sparked a feeling inside me; and that feeling began to grow. My illness also meant that I spent three years of my life lying in my bedroom with nothing much to do except read and Google and knit small animals. So I began to read. I read Virginia Woolf and Gloria Steinem and Caitlin Moran and then realized they were all white women and I might need to start looking a little further. I read Audre Lorde and Roxane Gay and Chimamanda Ngozi Adichie, and slowly but surely I began to understand and think and see. I began to understand that what had happened to me was a small ripple that took place in an ocean of pain, movement and change. I began to understand that gender equality was not in fact a thing of the past but a far-off dream for the future. A dream that generations of women and men had been fighting for and continued to fight for every single day. Once I began to understand that, I also began to understand that the assumptions I had held about what it meant to be a feminist were in fact a tool of the very systems of hate that these women were trying to smash. This system of hate (also known as ‘the patriarchy’) had concocted an image of a feminist precisely so young women would be deterred from continuing the fight. The lies we have been told about feminism have been fed to us to hold us back from a movement that is actually for everyone. A movement that is more beautiful and more potentially powerful than we could ever have dreamed. As I began to read I began to understand that feminists do in fact wear make-up (if they want to). They also shave their legs (if they want to) and love boys (if they want to). 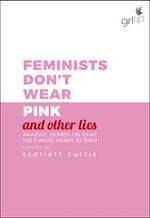 Feminists can also definitely wear pink, a lot of pink. The women’s movement has been alive and kicking for a very long time now. It is a beautiful and complicated timeline of people, theories, words and books that are constantly defining and redefining what it means to be a feminist. This book is not an academic textbook. It is not a manual on how to be a perfect feminist or a book of essays by professors of women’s studies explaining the history of the movement. Those books exist, and many of them are brilliant, but that is not what this book is. This book is a book of feelings that are transforming into thoughts that are transforming into action. Most of the amazing women who have contributed to this book probably don’t know much more about feminism than you do. Most of the women are just at the starting line of the lifelong journey to discover what it means to be a feminist and to fight the feminist fight. This book is not here to tell you everything you need to know about feminism, it’s here to show you that at the heart of feminism is women. Women who are complex and complicated, who wear make-up and wear pink and laugh and cry and get confused just like you. This book is here to hopefully show you that being a feminist isn’t quite what you thought it was. While my fifteen-year-old self was wrong about a lot of things, she was right about one thing. Feminists are rare birds. They are rare birds who fly above us, trying to look down and see the world for what it is. They look down and see the mountains that our world will have to overcome if freedom is ever going to be possible, and then they fly back down to earth to help us all with the climb. I am a feminist. And boy do I wear pink. What does the F word mean to you? The must-read book for 2018. Follow @feminists on Instagram for updates.